A mother has said she and her children had a "lucky escape" after a neighbouring house was destroyed in a suspected arson attack in Newtownabbey, County Antrim. The fire in Birchmount, in the Mossley area, on Saturday spread to the woman's house. "If it had happened at night time, I wouldn't have been able to get all my kids out in time," the woman said. The fire also damaged an electricity substation. 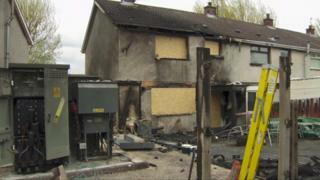 She told BBC News NI: "My neighbour came, banging on the window, shouting 'get out, get out - the house is on fire'. "We just managed to get out as the flames were coming up the side of the house." Northern Ireland Electricity said 50 customers were left without power in the area after the blaze spread to the substation. The Northern Ireland Fire and Rescue Service (NIFRS) reported the fire to the PSNI at about 14:00 BST on Saturday. NIFRS believes that a recycling bin to the rear of the houses was set alight before spreading to two oil tanks and the homes. Two vehicles parked outside were also extensively damaged.